If we define sustainable development as meeting the needs of the present without compromising the ability of future generations to meet their own needs, then it is in our hands to make good use of natural resources which are close to hand and not to endanger the natural system we have inherited with emissions that change the global balance. Spain is the second country, after Japan, in buying emissions rights, and only by investing in energy efficiency, by reducing emissions and by rationalising the use of raw materials, we can ensure the viability of development. The European Union has decided upon a zero emissions future in building, the latter being responsible for half of current CO2 emissions, mainly due to energy expenditure. Aspects such as the production of slabs in concrete structures represent nearly 25% of the total impact of carbon footprint in building. Knowledge of the solutions, their quantification in the lifecycle analysis and an adequate design of slabs could make great strides towards reaching sustainability objectives. 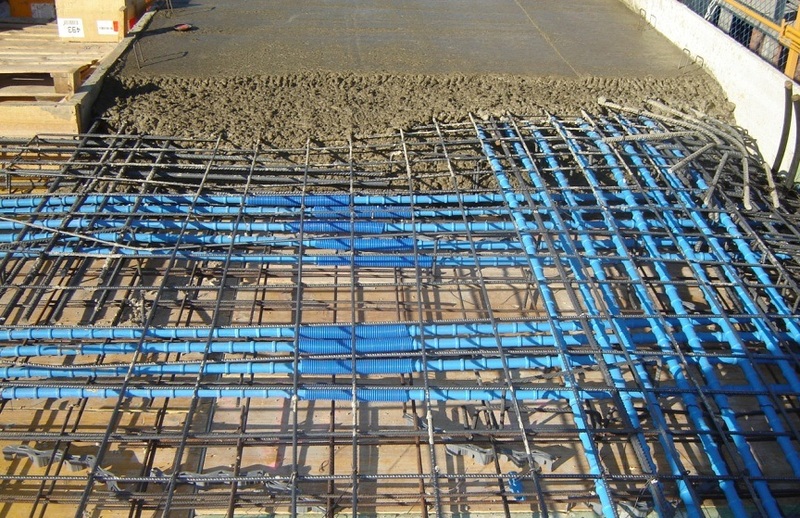 For example, the introduction of post-tensioning solutions in concrete flat slabs allows lighter structures, thinner slabs and a great reduction of materials. In most countries these designs, mechanical and economical features have enabled the system to compete economically with traditional in-situ concrete floor slabs; however, this is not the case in some other countries, like Spain. Introduction of sustainability criteria and specialization in construction can allow for this system to be introduced in the market, which can mean lower costs, improved performance and a focus on sustainability in construction. Estimation of CO2 emissions in building materials and energy consumption are values of great importance in the development of the construction industry. It has been possible to study the effects of various research projects on CO2 emissions of building materials in the Life Cycle Assessment (LCA) and how research can show new ways for the future reduction of emissions, in order to protect the interests of our industry. But above all, it is necessary to introduce sustainability criteria in construction based on reducing CO2 emissions and energy consumption, and also on a more responsible consumption of raw materials, as can already be seen in other aspects of the industry.